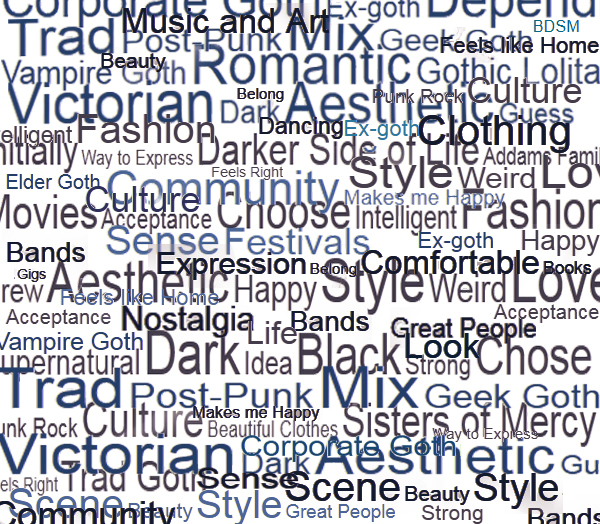 Goth – Just a Phase? 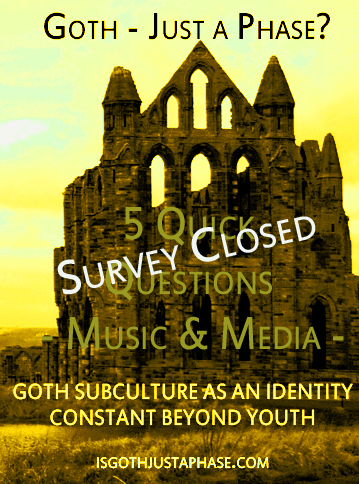 – Page 2 – Goth subculture as an identity constant beyond youth. Ok Australians, it’s your turn! I am now scheduling interviews for Australian folk early in the new year. I am based in Melbourne, but will be scheduling travel to other cities – so let me know if you are interested in participating. As with the International survey, I have reopened the Australian survey (linked below) if you were unable to complete it last time. Thank you if you completed this survey earlier in the year – there is no need to repeat it! Once again, a massive thank you to everyone who has expressed interest in this research and to those who have already contributed. If you are interested in participating further – feel free to contact me by email or Facebook. With all the events coming up this month, I have reopened the full International survey for a short time only for those who wish to participate – especially if you are attending a gig, event or festival in Europe. It will stay open throughout the Whitby Goth Weekend and event season, into the first couple of weeks of November. Surveys are now closed – thank you for your responses. Thank you to everyone who has expressed interest in this research. I am looking forward to interviewing over the next few weeks. Thanks also to everyone who has already participated particularly the very generous folks who have taken time out of festivities to chat to me – your contributions are greatly appreciated. Thank you to everyone who has contributed to the surveys. Additional shorter surveys will follow for those who wish to stay involved. I am following up the surveys with interviews and group discussions, first in the UK. 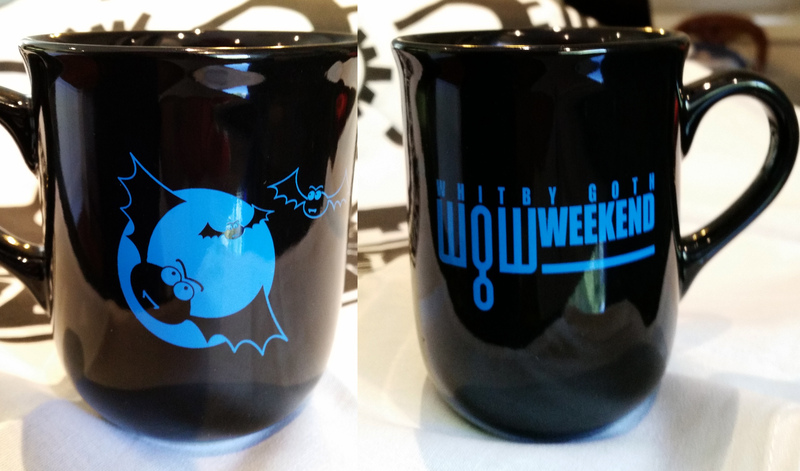 & then to coincide with the Bram Stoker Film Festival and Whitby Goth Weekend in Whitby October 22nd – November 1st 2015. Thank you for taking the survey – if you are coming to Whitby and you are interested in taking part in the project, let me know, it would be great to talk in person. I look forward to sharing findings from the surveys in the coming months. 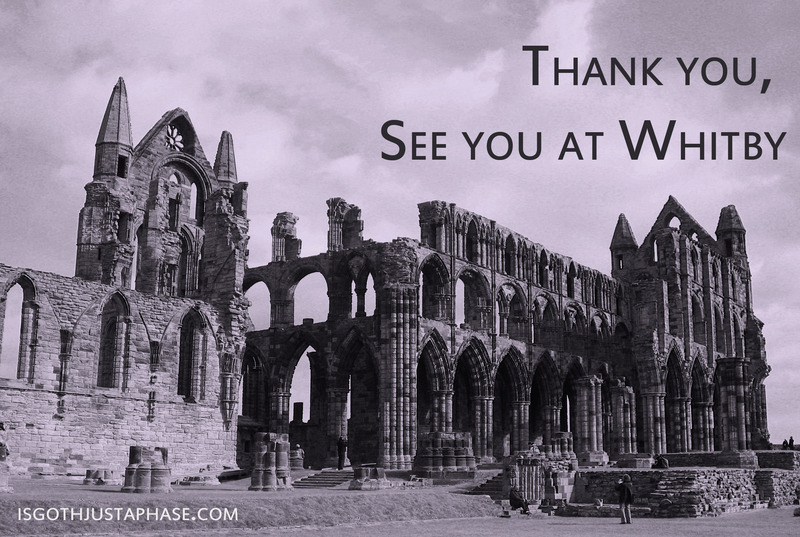 Thanks again for supporting this project, and I might just see you at Whitby!!! Back in the Day: Memories of the Perth Goth Club Scene 1989-1998 As discussed in a previous post, I have been exploring the visual nature of the Goth community as a source of inspiration and impetus for my research. By digging through my old shoe-boxes of clubbing memorabilia and photographing some of its contents I am attempting to catalogue an indicative selection of club flyers, gig pamphlets and other ephemera from the Perth Goth scene in the decade 1989-1998. A few are included here, and I will continue to add more to my Pinterest page as I digitise them throughout this project. During this time there were several highly creative, motivated and capable people in the Perth scene who collectively made stuff happen! 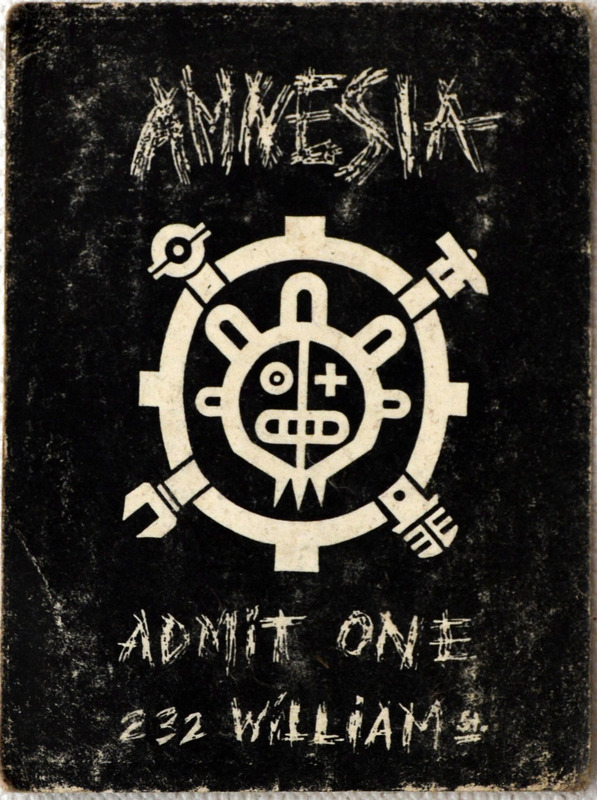 The flyers provide an illustration of the club/event activities of the subculture at the time; the start of this time period marks my early involvement in the club scene through my most active clubbing years during which I helped organise and promote Goth and Goth-Industrial club nights. The geographic isolation of Perth inspired an entrepreneurial approach to social enterprise within the Goth scene during this period. With the costs of travel high, bands seldom scheduled lengthy tours of Australia, and when they did the far-flung city of Perth was often left off itineraries. Who else remembers the I need a Cure tour petition?? While this resulted in a limited number of major bands performing in the city during this period, it succeeded in creating a self-supporting culture with an active club and local bands scene. Additionally, for some this isolation inspired travel and provided a catalyst for establishing connections between Goths living in Perth and communities overseas and interstate, which in itself generated diversity through drawing in external influences. Most people involved in the Perth Goth scene during this period actively contributed towards sustaining its social and economic activities beyond attendance at club nights and gigs. Members of the subculture established record stores, fashion design labels/stores, club nights, publications and other services to keep the subculture not just alive but thriving. A result of this communal desire to improve and support the subculture was a proliferation of specialised club nights and events, (particularly between 1992-5) organised by scene members with the support of nightclub proprietors. The level of activity, as illustrated by these flyers, gave the Perth Goth and Industrial scene a strong support base which was further enhanced by retail enterprises such as specialist stores and aesthetic services such as body piercing, tattooing and hair-dressing. This evolving sophistication of the Goth culture is also reflected in the production quality of the scene-generated ephemera. Initially, the quality of the materials appears secondary to the primary purpose of effectively advertising events to the subculture in suitably familiar language, using in-culture references and styles to speak to the ‘right’ audience. Improvements in technology, access to materials and reduction in printing costs during this period is evidenced by the transition of many of the brochures from cheap, photocopied amateur productions to more professional materials. Within this vibrant community, the emergence of subgenres is evidenced in the various club pamphlets. Some venues specialised in particular styles of music – industrial, alternative, indie-pop, Goth – and provided a venue in which events could be scheduled so as to satisfy the shared tastes of subsets within the larger Goth population. Individual DJs delivered dependable setlists which catered to the needs of the various key audiences. Growing from the Punk scene, early Goth nightclubs of the late 1980s (such as The Red Parrot, Asylum, Inner City Firm, Fruition, Amnesia among others) provided the Perth scene with predominantly English-influenced Gothic Rock nights and my first introduction to the scene. These clubs featured music from bands who themselves often did not consider their music Goth, nevertheless the music was (and is) heavily favoured by Traditional (Trad) Goths and played in almost all Goth clubs. Industrial music had begun to find commercial success in the early 1990s; frequently featuring Goth-influenced imagery, alternative iconography and dark themes; it was a natural high-energy companion to the comparatively sedate musical approach of Goth. The flourishing Industrial genre heavily influenced Perth Goth club nights, with setlists often featuring a mixture of Goth/Electro/Industrial and other alternative genres to a lesser degree, with a marked increase in the number of dance-oriented club events being scheduled in the early-mid 1990s. 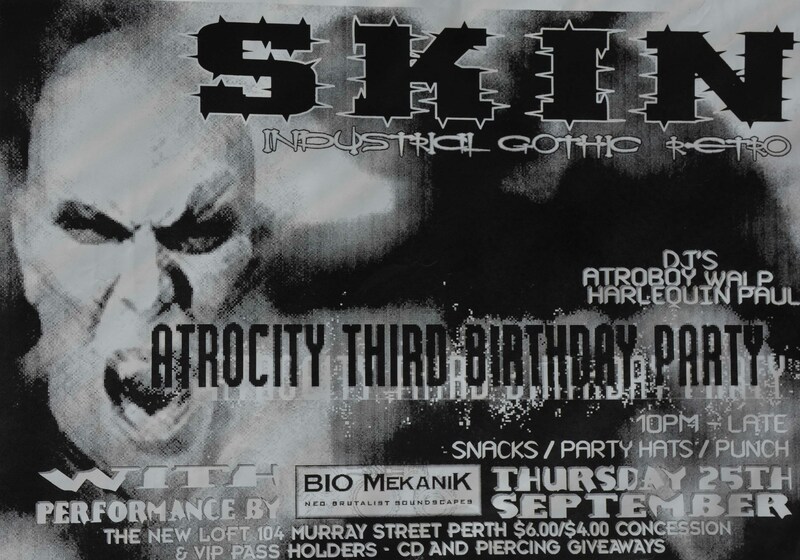 The promotional material represents the spectrum of aesthetics within the Goth scene, with Industrial flyers often favouring harsher, mechanised forms and horror themes. 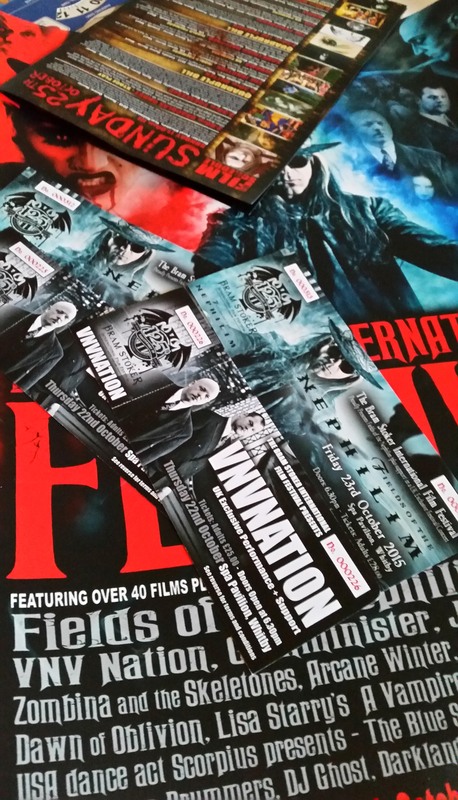 Goth flyers utilise vampire, kitsch-horror and Victorian-influenced imagery to define and promote more traditionally influenced Goth events. Alongside these are other alternative bands and genres including shoe-gazer and indie sets. These distinctions demonstrate the stylistic differences in terms of music styles and visual representation as well as design/iconography within the scene, simultaneously it shows the Goth subculture’s ability to co-exist with compatible music styles and social groups. In 1990s Perth, there was an amicable yet apparent schism between those who principally favoured less energetic rock-based music (the Trad-Goth aesthetics) in comparison to the parallel genre broadly grouped under the moniker Industrial, featuring faster, more electronic dance-oriented music styles, less formal Goth-influenced dress and an emphasis on dancing rather than exclusively focussing on social interaction within the club environment. Clubs nights at Geremiah’s, The Loft, Interzone and Skin (among others) catered for those who sought dance-intensive nights primarily featuring Electro Body Music (EBM) and Industrial tracks with strong Goth influences. With music containing mechanical and electronic noises accompanying heavily distorted vocals, the Industrial music genre also generated an occasionally uneasy association with heavy metal and thrash music; genres less congruent with the more flamboyant Goth scene. This shared patronage, however, helped sustain the subculture and provided financial stability in an otherwise niche market in a geographically isolated city. At times this resulted in uneasiness, when patrons unfamiliar with Goth aesthetics reacted to the extreme styles of the Goth patrons, sometimes approaching Goths with benign curiosity, sometimes with genuine animosity and attempts to generate confrontation. 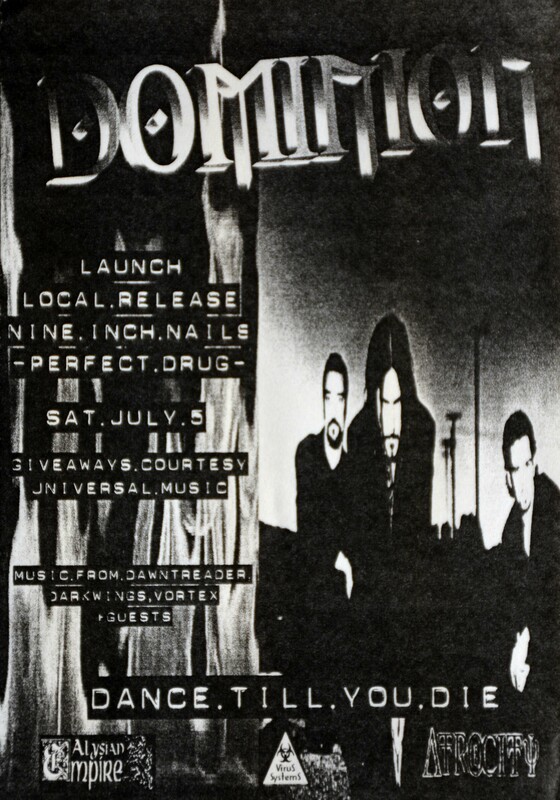 While these events were rare, the reliance on nightclub proprietors to provide space for Goth events, in part prompted future generations of the scene to be more self-managing, establishing dedicated Goth events management and membership-based clubs such as Dominion to better serve the needs of the Goth community. The flyers presented here articulate by example the self-generating and sustaining nature of the Perth Goth and Industrial scene and record a period of high creative activity in the subculture. The ephemera itself represents examples of subculture specific iconography and thematic preoccupations, and demonstrate the scene’s ability to effectively self-promote and instinctively engage with its participants. Perth, Western Australia for basic information about the city see : http://en.wikipedia.org/wiki/Perth  Not all clubs of the period are represented here, just a sketch of the overall scene. I will continue to add to this theme in future posts, including excerpts from various street press and other media.